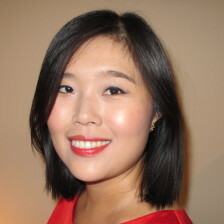 Featured on the World Fixer Blog! 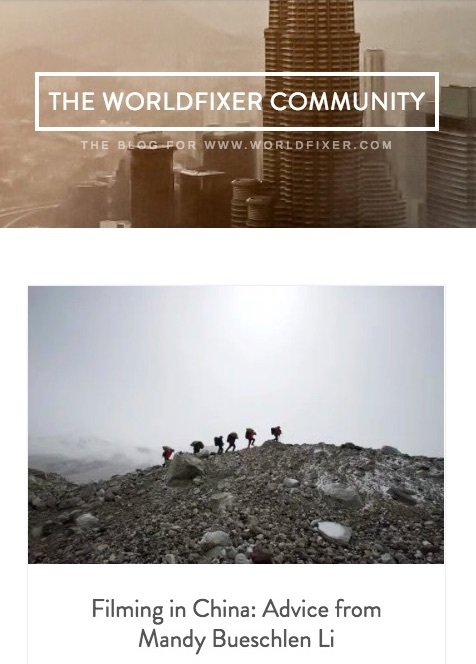 I was recently featured on the World Fixer Blog for an interview on filming in China. Click on the image below and take a look! It was the morning of the last filming day of China From Above 2 – Everest. Even though it was mid-May, summer life in the city felt like a distant memory. After a sleepless night in the Rongbuk guest house 5,000 meters above sea level, I dragged my feet to the camp’s little watering hole to meet with the crew. The conditions were the harshest I have ever experienced in my filming career. I had almost nothing left to give. Severe altitude sickness had taken our sound recordist off the mountain and into the emergency room with a pulmonary edema. I didn’t know if our DoP could even make it out of bed that day. Everest, though, was right there, always in view – majestic and eternal. Dark clouds were gathering behind its distant silhouette. Another heavy snowfall was on the way. That morning, I realized that I was truly relying on my spirit to help me finish directing. When I got the call for the project a month ago, I was more than excited. China from Above is a great documentary featuring drone footage that tells stories from a unique and engaging bird’s eye view. It will be broadcast on the National Geographic Channel, CCTV and online. The first season broke the Internet with 230 million hits! 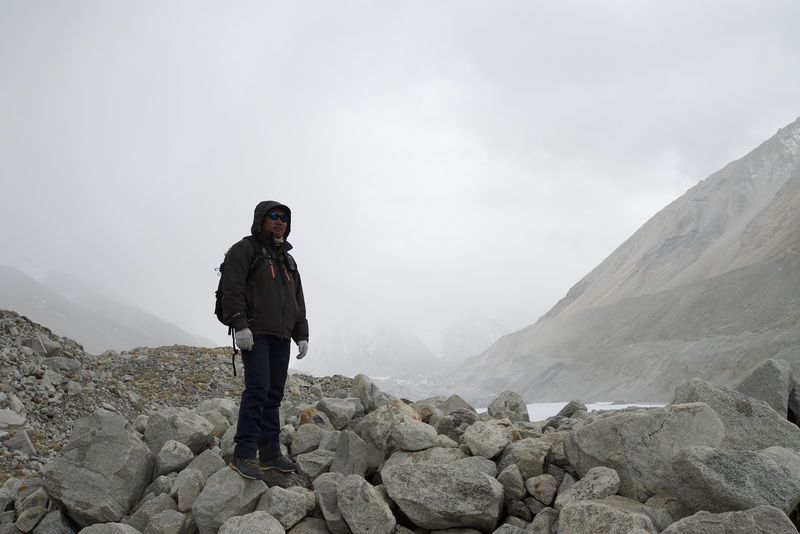 I knew we would get some stunning visuals in and around the base camp of the Everest. But no one had ever tested drones at that kind of altitude under such difficult conditions. We would be the first. We usually take energy from nature, from the ground and air, but at 5,000 meters where oxygen levels are just 40% of what they are at sea level, nature takes energy from us instead. You can feel it in every breath and every step, especially at night, which is the hardest time of all. When the sun is gone, there only darkness, cold, and the sound of my elevated heartrate and pounding headache. 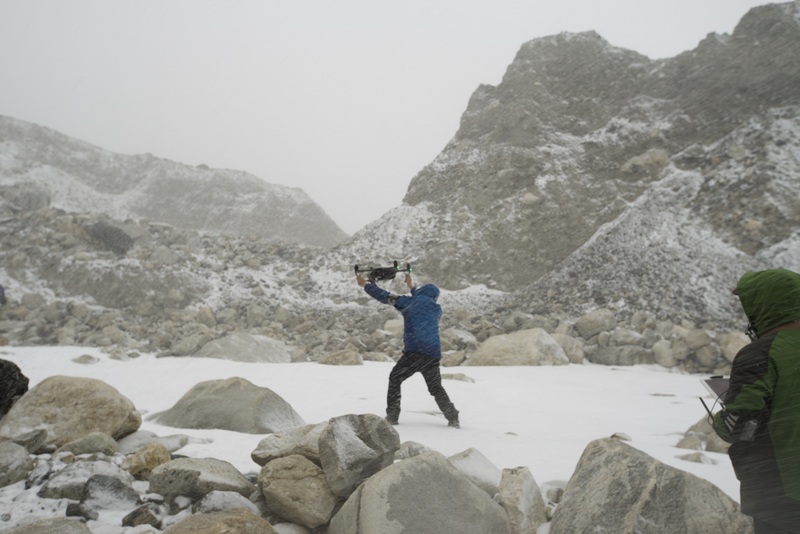 But in end, while we didn’t summit Everest, our drones flew. Even with frozen landing gear, they still captured stunning images of that inhospitable, beautiful world. We came home successful. The experience has made me a stronger director and a stronger person. What were some of the lessons the mountain taught me? I am a strong believer in the crucial importance of pre-production. I need to get background information, talk to the stakeholders of the story, ask them for advice and other people we should talk to. I need to get the shooting script, shot list, question list and shooting schedule ready before we leave. 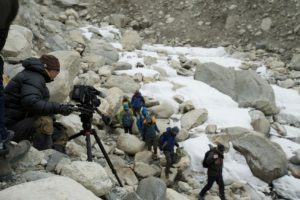 In this situation, because of the special circumstances of a filming permit in Tibet, we couldn’t talk to stakeholders until very late in the process. 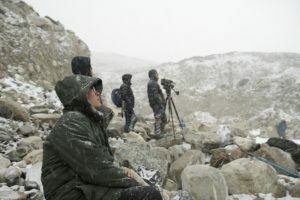 Plans for a separate recce and filming trip had been scrapped because there was so little time left in the already short Everest climbing season. That being said, I am so glad to have had a chance to talk to the climbing association before we set out. From that 40-minute phone call, I learnt so much and found a better story, a stronger character and a vision that was much easier to realize. We moved from conquering Everest to protecting it, from a Man vs Nature story to man trying to save nature, and from a 20th century story to a 21st century story. Even though it was very tight, we still got a shooting script, a shot list and question list ready for when we arrived in Lhasa based on the information and schedule we had at the time. A lot of that changed later on, but having those documents as a foundation to work on was a blessing. 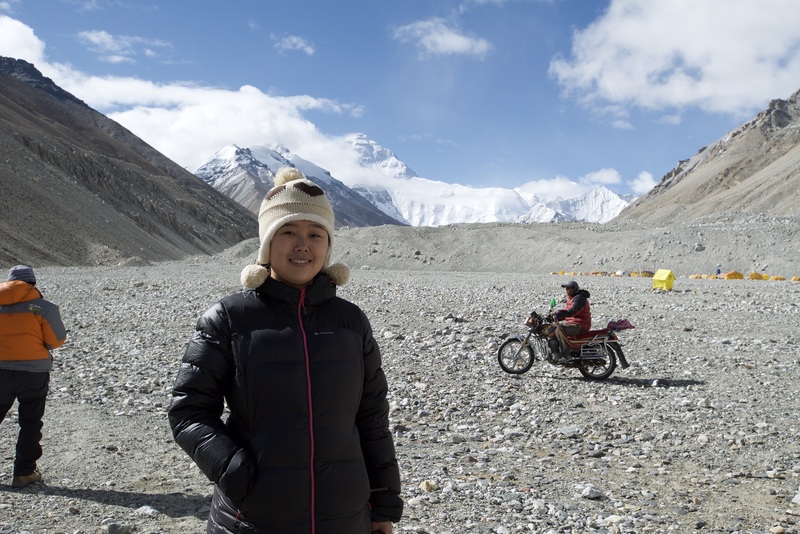 As soon as we got to Lhasa and met with our character, we learnt that the schedule was moved 6 days ahead. All our planning was thrown out the window. We had to move the whole crew’s schedule forward, nix their acclimatization days and get them base camp ASAP. The producer also flew in a backup DoP the very next day. Even with all these, we could only catch the climbers and yaks coming back to the base camp and missed out on the original story of following them on their way up. Every day came with more changes. We just had to roll with it. At the same time, I kept the structure of the story in mind and tried to adapt and find solutions to tell a story that was compelling and complete. Letting go wasn’t easy. At first, I was frustrated and worried because of the constant change and uncertainty. But it didn’t help anyone; stress only made my altitude sickness worse. Thankfully, I gradually accepted it and just told myself that we would do our best given the tough circumstances and let go. Originally we thought the yak porter team leader would be one of our main characters. 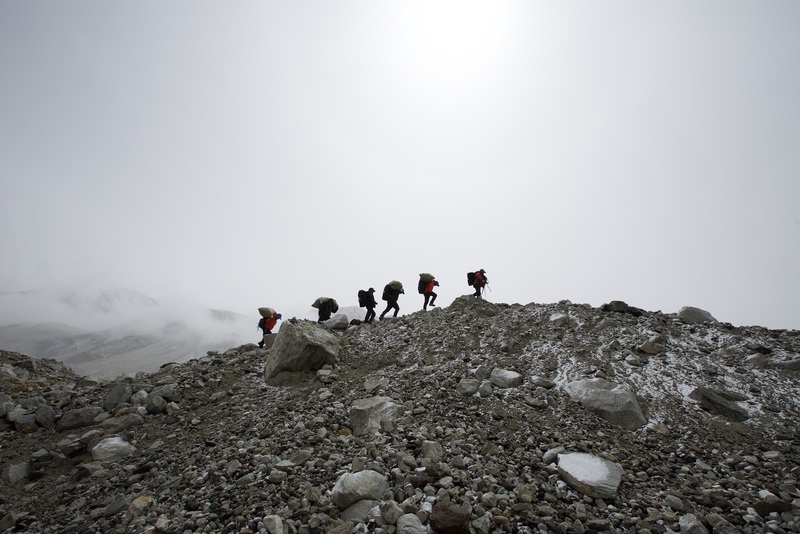 Once we arrived at base camp, we realized that the leader was a weak character with little to say. From my previous conversations, I knew that the Everest clean-up operation’s head climber Pema Trileg was a strong character – he’s a Tibetan who has summited Everest and has a strong desire to protect the mountain he believes to be hol. 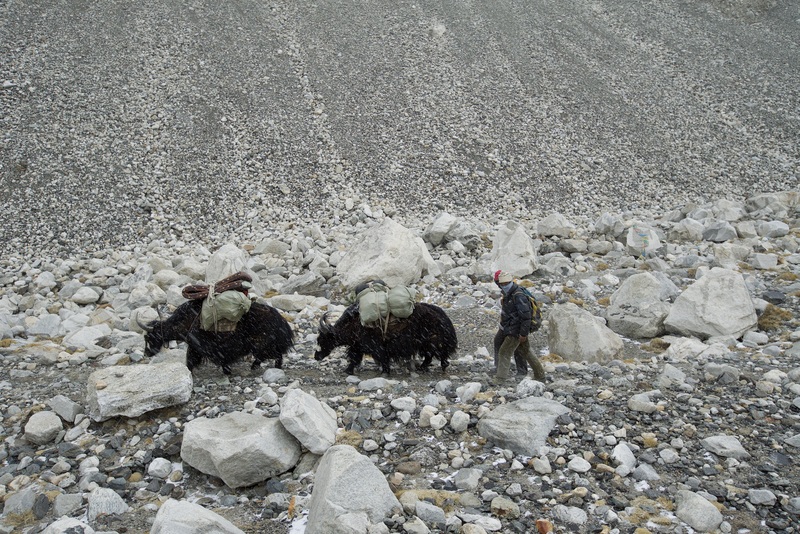 We quickly changed our plans to focus on the Everest clean-up team and put the yak porters in a supporting role. 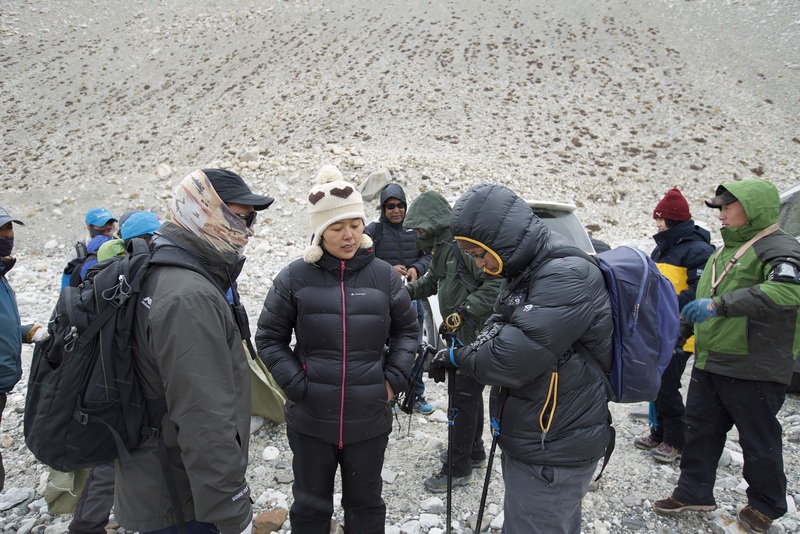 Instead of having interviews with the yak team, I arranged scenes for Pema to interact with them in natural setting. It turned out to be much better and felt more natural than before. At the end of the day, I think all stories are human stories. The single most important factor of a story are the characters in it – the audience will only go on a journey with you if they care about the hopes and challenges that characters face. In order to make the audience care, the characters themselves have to believe in what they do and really care about the subject and show true desire. If the character doesn’t have those qualities, it’s best to change the character. A story with a weak character will always feel weak no matter how great plots are because the audience will not feel connected to or care about the character if they don’t care about themselves. Set up scenes when necessary. In documentary filmmaking, we hope to capture reality in real time as it happens. But sometimes, it doesn’t work out that way. We have to set up scenes to complete the story. 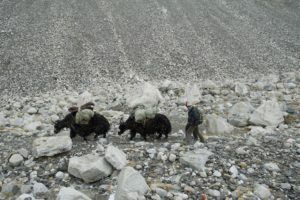 We captured the return of the climbers and yaks from their clean-up operation and the sorting of the trash at base camp. But we missed the ascent. By asking the climbers to go with us from base camp towards the advance camp for a few hours, we were able to film them getting ready, leaving the base camp, their climb ascending Everest, making their way through different terrain, picking up trash on a glacier and their trials during the journey. This made the story much more complete but still true at the same time. May is the best season for summiting Everest because of its comparatively calm weather. We experienced beautiful sunshine and blue sky days with not a tread of cloud at base camp and Everest revealed herself fully to us. But on the filming day of both the ascent and descent, it was snowing heavily and we couldn’t see Everest at all. The ideal shot of a climber going up with Everest in the background vanished. The drone struggled with the snow, and if we were unlucky there were flecks of snow on its lens. After discussing with the drone crew, we decided to go with a 90mm lens and keep the camera head down for top down shots or direct the camera to the same direction as the wind was blowing. The climbers trekking on the ridge of the mountain in heavy snow captured by 90mm lens on drone with compressed background was a killer shot. In the end, the snow served the story perfectly and exemplified how much energy and risk the climbers had to take to bring back easily discarded trash on the highest mountain on earth. In productions we have to rely on our team members. In a hostile environment, this is truer than ever. Our sound recordist contracted severe altitude sickness quickly after he arrived at base camp. He lost conscious in a few hours and we had to send him down to the closest hospital to treat his condition, which had become life-threatening. At the same time, we still had a full shooting day ahead of us and were without a recordist. And we still needed sound, as good as possible. The DoP came up with the solution of taking the sound recordist gear – the boom and wireless mics. We took one channel as wireless mic/shot gun and the other boom straight into the camera and recruited the camera assistant to be the boom operator. It wasn’t ideal, but it worked. Because of how extremely remote the location was, there was little sound pollution; we could hear the yak bells before we could see them. That might have saved us. The last item on the filming list was the ascent. We were aiming to climb with our characters to the glacier, which would take about 3-4 hours. I knew that with the physical condition I was in at the time, it was an impossibility. If I were to go, I would have slowed everyone down and maybe force them to abort the mission because of me. So I put the trust in the crew’s hands. I told them my vision, give a brief list of the must-have shots to the DoP and the drone crew and trusted them to do the best under the circumstances. I am so proud and extremely grateful to say that they delivered more than I ever expected. They pushed their bodies and machines to the absolute limit and got amazing footage. Looking back now, I have to say that the story turned out to be much better than we originally thought. It was a great opportunity as a director. I have to thank all my crew members for giving their best in Everest’s extremely challenging environment and appreciate it from the bottom of my heart. I am extremely grateful that the mountain has accepted us to tell her story and the story of her people. As the holiday season gets into full swing, I’ve been looking back and feeling grateful about all the projects I’ve been involved with in 2016 – it’s been a very successful year. I had some great opportunities working on some awesome productions. Personally, 2016 was a big year for me too. I got married in Bali, Indonesia on June 30th this year and changed my name to Mandy Bueschlen Li. Here is our wedding video filmed by my friend David Tong that I edited myself. I am very grateful for yoga. It helps me to nurture the inner self and find peace, as well as keep me calm and creative in my work. Diving has also become a new passion for me. I was certified by PADI as an Open Water and Adventure Diver this summer. It’s opened up a whole new world for me. There’s more to explore in life and in filmmaking in 2017!